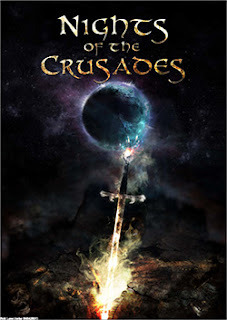 Nights of the Crusades by M.J. Alishah is a gorgeous, rich fantasy roleplaying game set in a mythic-historical world of the One Thousand and One Nights and crusades. Lavishly laid out, delightfully illustrated and painstakingly researched, it is a thick tapestry of a game. The core rulebook is free and subsequent modules are paid for; but this is of no consequence. The flesh of the 100 page core rulebook will sink you deep into the world of scimitars, psychotic Knights and Djinn dunked in realistic grit. A story game feel with campaign aspirations and the most atmospheric book I've read in a long time. Character creation begins with psychoanalyst questioning. Why are you here, what drives you? Tell me about your childhood. Did you fancy your mother? I felt like it was going to ask me to point at somewhere on a doll. You then pick allegiances, made up from faction (which side of the war), religeon, classes and an organisation (such as a gangs and so on). Each carries a "disposition", which is a positive/negative level of influence. The Knights Templar love you now but after you've gutted a hundred of them while they slept, they may not invite you round for tea and biscuits again. Skills (facets of a character that grow over time) called Expertise and are grouped together Communication, Knowledge, Melee, Ranged and Vigor. There's a big old list to help you pick and the groups are what you roll against, a bit like Attributes but not. Wealth allows you to purchase things but it is a statistic in itself. Being robbed, hoodwinked or bribed will all affect this Wealth statistic. If Wealth hits 0, you roll on a brutal table of poverty. If your Wealth hits an upper limit, you roll on a prosperity table, which can mean you get robbed. You lose? You lose. You win? You (might) lose. Brilliant. This creates wealth as a charming game effect beyond a custom bling suit of armour with gold boots. Finally, your character is fleshed out by depleting Wealth with stuffs. I have a frankly filthy fetish for equipment lists and Nights of the Crusade satiates it. You can buy servants, books (with spells and skills inside), formulas (for alchemy) and intoxicants (for stoners). It is nice to see stoner culture getting RPG representation. The core mechanic is Expertise group plus modifiers versus a target number (called the Apex) with criticals on a 1 and 10. There are slightly different systems for combat and non-combat, the difference being the actions you perform and the outcomes. For example, if you're negotiating (typically non-combat but not for my energy-lance-it-from-orbit-negotiation player group) then actions include Appeal, Dismiss and Fortify; the outcome being your argument is accepted. Combat has initiative (called Awareness Test) and you can do a number of actions a round. 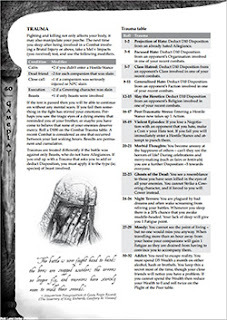 You choose from a list of actions that include every sort of combat you might want. Injury is descriptive ranging from "That tickles! Oh, you meant to hit me..." through to "Can someone unscrew my helmet so I can scrap my brains off the inside". Flavour is added through details like Hostile Stance, where your character tries to get into the right mood for slotting someone up a treat. Hostile Stance is an opposed action and can give modifiers in either direction. A lovely touch. On one side you might have had a bad day and want to take it out on the poor target. On the other hand, you may have got laid that morning and rather just eat a big lunch and doze the afternoon away. The trauma of hacking foes into bite-sized giblets must also be taken into account, there's a wonderful table that reads like one of my players' medical report. In a long term campaign, your character is likely to turn bonkers but it will be fun watching them do so. 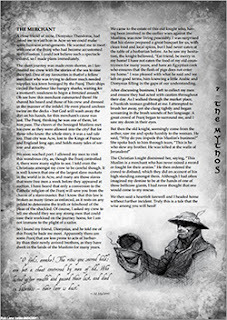 In Nights of the Crusades, stories are mechanised to produce a resource called Pearls of Wisdom. A story is like an adventure, made up from scenes of Adventure, Drama or Mystery. A character is a focus of a scene and generates Pearls of Wisdom for engaging in Adventure, Drama or Mystery. Pearls are spent like XP. This is where the story game feel comes in. Symbols of Power are another neat mechanic that allows your character to grow in importance. You buy Symbols of Power with Pearls of Wisdom and see you equip your own Fief (patch of land) with libraries, marketplaces and so on. Excellent writing and research is married perfectly in Nights of the Crusades. The world of the Middle East during medieval times is illustrated with descriptive text throughout. The imagery is good but it is the snippets of story that describe the lives of real people that bring it to life. I can imagine crafting a war weary Knight longing for the green grass of Normandy or a "Desert Loving English" Lawrence-of-Arabia character obsessed with desolate golden sands and war. Huge effort has gone into describing the horrors of medieval war and life with sensitivity, care and a style that draws you in. RPGs have a difficult line to walk between being thematic and a reference. 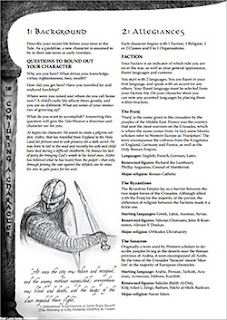 Nights of the Crusades is all about theme but is a pain to use for reference. Even referring back to the book for writing this review, I had to dig through blocks of descriptive theme text to get to the nub of a rule. Other games solve this by having rule callouts, appendices with cheat sheets and the like. The book should also cross-reference itself. I love having all the Expertise areas at the back but there should be a page reference in character creation. It is fine to have players jump back and forth to make a character but make it easy for them. My other concern is with naming. When designing a game, you must strike a balance between naming things in line with the theme and using standard roleplaying terms. If you name everything with standard terms, your game reads like every other. If you make up a bunch of new terms in keeping with your theme then this acts as a barrier to experienced players getting to grip with your game. For example, I would like Expertise areas to have more middle-Eastern sounding names, "Communication Expertise" sounds like the sort of thing a business analyst would write. The beautiful layout is a little low in contrast in places, and one or two of the sketches should probably be omitted. I would tend to put weaker art toward the back of the book. Also, the map (which has scale in days - great!) needs to demonstrate the difference between land and water. Nights of the Crusades is a paid-for-product that is given away for free. It is clever marketing - but no trick. The core rulebook is not a taster product but a fully fledged roleplaying game that will offer thousands of hours of play. 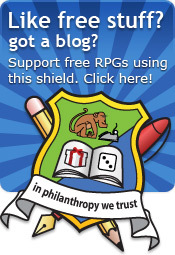 I view the extra modules more of a donation for thanks than a crutch to make the game walk. The mechanics include a few unique touches but is a familiar description-heavy roll-versus-target number affair. It is the setting that glows. Every sentence leaps from the page and stops you. Makes you think. What was it like living back then? What if the One Thousand Arabian Nights were true? To spawn those two questions alone makes the game a success. Sounds like a very interesting system and setting! I may have to check this one out. Love me some djinnbustin'. And a great review Rob! Thanks Jens, definitely have to give this one a read - it's so thick with setting you'll be scraping it of your retinas.